As is well known, St. Augustine of Hippo, first with some friends and afterwards, as bishop, with his clergy, led a monastic community life. Vows were not obligatory, but the possession of private property was prohibited. Their manner of life led others to imitate them. Instructions for their guidance were found in several writings of St. Augustine, especially in "De opere monachorum" (P.L., XL, 527), mentioned in the ancient codices regularum of the eighth or ninth century as "The Rule of St. Augustine". Epistola ccxi, otherwise cix (P.L., XXXIII, 958), contains the early "Augustinian Rule for Nuns"; epistolae ccclv and ccclvi (P.L., XXXIX, 1570) "De moribus clericorum". The instructions herein contained formed the basis of the rule which, in accordance with the decree of the Lateran Synod, in 1059, was adopted by canons desiring to practise a common apostolic life (Holstenius, "Codex regularum", II, Rome, 1661, 120). Thence the title "Canons Regular of St. Augustine". Later, many monastic societies and brotherhoods, especially in Italy, adopted the Augustinian Rule, either voluntarily or by command of the pope, without, however, giving up certain peculiarities of life and dress introduced by the founder, or handed down by custom. These differences led to their being confounded with other orders (e.g., the Friars Minor) and gave rise to quarrels. To remedy these evils and to ensure harmony and unity amongst the various religious congregations, Pope Alexander IV sought to unite them into one order. For this purpose he commanded that two delegates be sent to Rome from each of the hermit monasteries, to discuss, under the presidency of Cardinal Richard of Santi Angeli, the question of union. The first meeting of the delegates took place on the first of March, 1256, and resulted in a union. Lanfranc Septala of Milan, Prior of the Bonites, was appointed the first prior-general of the new order. A uniform black habit was adopted, and the staves formerly carried by the Bonites to distinguish them from Friars Minor were dispensed with. The Bull "Licet ecclesiae catholicae", issued on 4 May, 1256 (Bullarium Taurinense, 3rd ed., 635 sq. ), ratified these proceedings and may be regarded as the foundation-charter of the "Ordo Eremitarum S. Augustini"; and furthermore, the pope commanded that all hermit monasteries which had sent no delegates, should conform to the newly drawn up Constitutions. Saint Augustine, by Philippe de Champaigne, 1650. In this painting, the Flemish artist Philippe de Champaigne portrays Augustine in his studio. In one hand Augustine holds a feather pen, and in the other, a flaming heart. The flaming heart – a heart on fire for God – was one of Augustine’s traditional attributes. 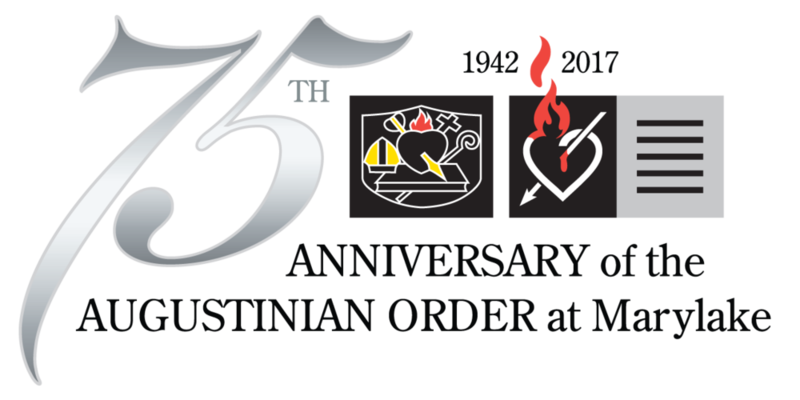 2017 marked the 75th Anniversary of the Augustinian Order at Marylake.